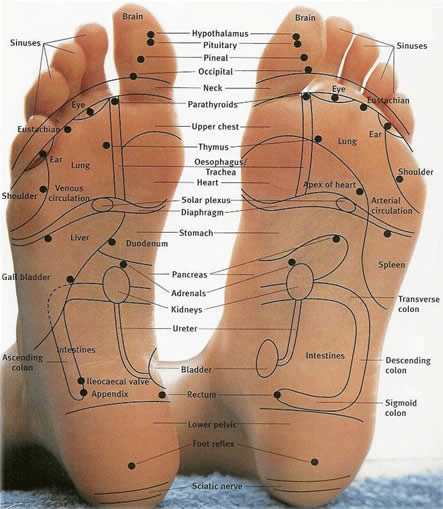 During a typical reflexology session the Reflexologist will take a detailed medical history. Sessions are usually performed in a comfortable couch. The practitioner will make a visual and tactile examination of the area to be worked before beginning the precise reflexology massage movements. The particular types of movements involved require the application of an appropriate pressure using the thumb and fingers. Reflexology can be a wonderfully relaxing experience where you can take time out from everyday pressures. The therapist’s expert touch will help you relax which can help improve mood, aid sleep and relieve tension. The result is an overall sense of well-being. Depending on the reasons for you looking for Reflexology, we normally recommend at least 5 treatments and for this reason we have a reduced rate for booking a course of five treatments. You pay for 5 upfront and receive the 6th session for free. Fibromyalgia was first described in the medical literature in 1843 as a type of rheumatism “with painful hard places.” There has been considerable debate over the years whether such a disease even existed. In the last decade rheumatologists have accepted fibromyalgia as a disease and given it an insurance number (CPT 729.1). Diagnosis has not changed much in a century and a half: there is no lab test; the physician still looks for painful hard places. Finding tenderness on palpation of at least 11 of 18 specific sites in the absence of any other disease to explain the tenderness is the current method of diagnosis. Reflexology is a non-intrusive complementary health therapy, based on the theory that different points on the feet and lower leg correspond with different areas of the body. Reflexologist's work holistically with their clients and aim to work alongside standard healthcare to promote relaxation and improve well being. Improved well being is much more than simply the absence of illness; it also includes an enhanced frame of mind, better relationships with those around you and increased happiness. Reflexology is an ancient therapy that has been practiced for over 5000 years and was introduced to the western world over 100 years ago. As holistic practitioners, Reflexologists' are there to support you as a whole person and promote your well being. Reflexologists' do not diagnose, prescribe or cure. Reflexology acknowledges that every person is unique ; it is not possible to know in advance how you will react to a treatment. There is an interesting research study on reflexology and fibromyalgia from Iceland. The six women aged between 27 and 55 with fibromyalgia were given 10 weekly reflexology treatments. All had suffered from a shock, accident or traumatic experience before the onset of the illness. They were asked to fill in daily symptom diaries for 13 weeks, starting before and ending after the reflexology sessions. Four of the six women noticed dramatic changes after six to eight treatments and felt very much better after the 8th and 9th weeks of treatment. In the early sessions, generally the pain changed and became worse before getting better. Other symptoms also responded to the reflexology such as migraines and oedema. Five women also found they felt less tired and could cope with better with work responsibilities. Of the two that showed little improvement, one had very severe symptoms and the other experienced aggressive pain that briefly benefited from the reflexology but returned after the drive home.